Need help on formatting the sources you cite in your academic writing (e.g., APA, MLA, etc.) or want access to full-fledged online bibliographic management systems-like "RefWorks" or 'Zotero?" Visit SU Libraries Citation Support website. Examples of citation formatting helpful when referring to data pulled from various specialized databases in business and advertising research. SU Libraries offers numerous research tools and information sources to assist you when investigating the world of advertising. Explore the linked sections of this guide for leading examples of these tools. An audiovisual library of more than 120,000 U.S. and international advertisements (1999-present), including Television, Digital, Print, Radio, and more. Content originates from over 20,000 advertising agencies, each providing critical information, such as Title, Agency, Advertiser, Brand, Taglines, and full credits. Adforum offers playlist features and a search that allows limiting of results to specific industry sectors and product categories in combination with countries of origin and media types. Award winning advertising can also be retrieved by award name and year (e.g., Clio, Effie, One Show, etc). Mintel offers a series of research reports covering the US marketplace. Each market research report combines data & analysis of the competitive landscape, market-share analysis and consumer profiles. Complex demographic issues are broken into easy-to-understand sections, explaining consumer behavior and demonstrating the structure of the market. Before entering the website, users are required to sign in to their Mintel Reports Personal Profile or to create a New Profile. Data from national surveys of U.S. consumers. Variables cover numerous consumer demographic categories, product usage, leisure activities, and exposure of those market segments to different genres and branded titles of websites, television programs and magazines. University Reporter data is drawn from GfK MRI’s “Survey of the American Consumer,” but excludes survey response data on consumer attitudes (psychographics). Researchers seeking consumer opinion data can consider use of other databases, such as SIMMONS OneView, eMarketer or Mintel Reports. Authenticate, retrieve Registration Code, and follow instructions to set up free personal account and password. A media planning resource leading to online directories for television and radio broadcasting, digital media, print newspapers and magazines, place-based and outdoor media. In addition to local market profiles and a tool called local market audience analyst, SRDS covers websites, programmatic media planning and digital networks & technology. An online database that tracks millions of brands across 18 media and ranks top spenders by industry, parent, brand, etc. Three simultaneous users only. Communication Source combines Communication and Mass Media Complete and Communication Abstracts (formerly published by Sage), and includes many unique sources not previously available in other databases. Communication Source offers abstracts and indexing as well as full-text content from publications worldwide pertaining to Communication, Advertising, Linguistics, Rhetoric and Discourse, Speech-Language Pathology, Media Studies and other fields relevant to the discipline. This Web site is the on-line version of Advertising Age, a magazine that has strived for over 70 years to produce quality information, news, and feature articles relating to the advertising industry, consumers, and global economy. Access media news, search through the data center, or read special reports on the influences, decline/increase, and future of advertising. The ASRC Online Archives provide vital guidance for national advertisers and law firms who want to ensure their advertising claims are truthful and accurate. The cases provide in depth knowledge of important advertising issues which can help to prevent problems in advertising substantiation before they arise. Formerly NARC Online Archives. SU students or faculty wanting access for a specific case(s) - can contact Public Communications Librarian, Michael Pasqualoni - with that identifying information - at mjpasqua@syr.edu (315) 443-3715. One of the largest academic streaming video collections in the market, containing tens of thousands of educational titles, and also U.S. and international feature films. Kanopy partners with over 800 producers, including the Criterion Collection/Janus Films, Kino Lorber, First Run Features, PBS, BBC, California Newsreel, Media Education Foundation and more. Some titles include transcripts and closed captioning. 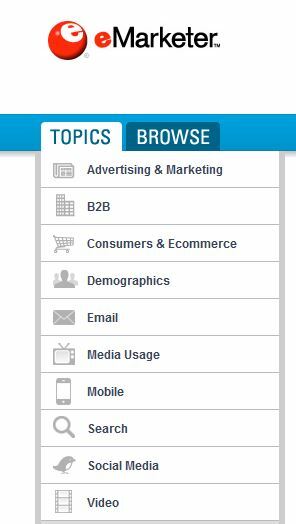 Advertising students can click the "browse subjects" menu to explore titles available under the category "media & communications." eMarketer is a repository of data and discussion about digital marketing, media and ecommerce. Covers information environments and technologies that some traditional industry and market research databases overlook, with a focus that includes mobile computing, online advertising, tablets, smartphones, mobile payments and more. The eMarketer database curates a large collection of presentation friendly data visualizations, which draw upon thousands of published industry sources and leadership interviews. Concise, single topic summary reports are included to assist with the development of media strategies, budgeting and other data driven presentations and analysis. Digital market data for numerous countries are represented, with over 10,000 new data charts added each year. Download options include Excel, PowerPoint, JPG and PDF. Non profit trade association for the U.S. broadcasting industry. 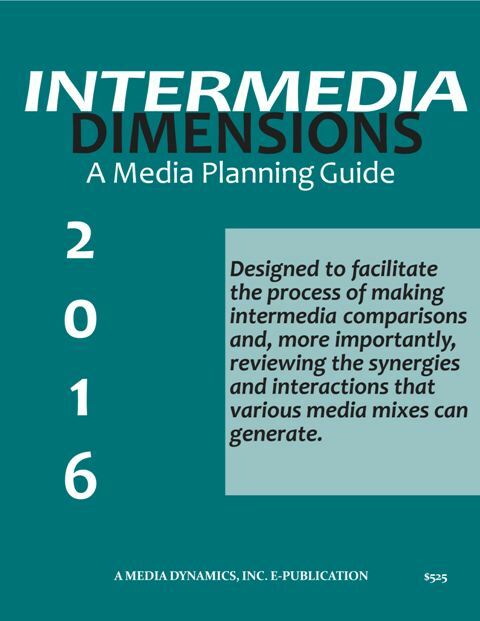 Intermedia Dimensions (Media Dynamics, Inc.): Reference book title useful for cross-comparisons of different media types (online, TV, radio, magazines, etc.) for relevant audience demographics, media ‘reach,’ CPM (“Cost per Mile”) data for advertising as well as qualitative comparisons of various media types and implications for media planning. 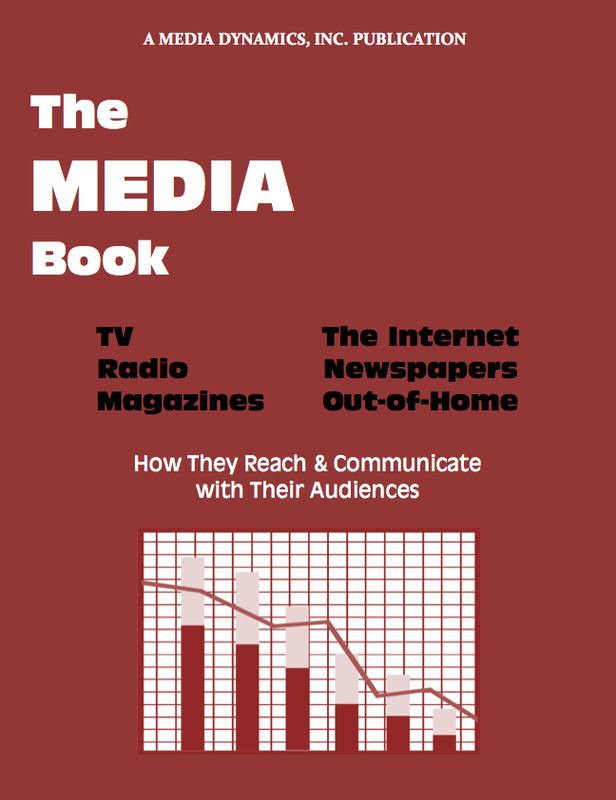 The Media Book (Media Dynamics, Inc.): In a single reference book, this 2014 edition offers quantitative and qualitative aspects of performance for all six major media—TV, radio and magazines, the Internet, newspapers and out-of-home (including digital). Provides media planners and buyers and media sellers with a conciser review of all aspects of media performance including a historical overview, audience reach, demographic appeals and CPMs. Also includes proprietary estimates on subjects such as ad exposure factors, ad awareness levels by GRP levels and ad wearout. Includes some data Media Dynamics obtains via partnerships with other leading research companies like GfK MRI, Experian and Scarborough. Need help on formatting the sources you cite in your academic writing (e.g., APA, MLA, etc.) or want access to a full-fledged online bibliographic management systems-like "RefWorks" or "Endnote Web" Visit SU Library's Citation Support website. A list of media directories and other possible starting points for Newhouse students when career planning or researching industries, companies or job markets. This PDF document lists media directories and other sources that may help any Newhouse student looking to explore leads for career planning purposes and related industry research into companies and job markets. Be sure to also visit Newhouse's Tina Press and David Rubin Career Development Center.